Receiving your Screenflex room divider is easier than you think. Since all Screenflex dividers come fully assembled you just need to remove the carton and your room divider is ready to use. Our room dividers are packed securely in tall cartons about the size of a refrigerator. It is recommended that two people receive the delivery. Each Screenflex divider weighs between 85-240 pounds. The truck driver will call one or two days before delivery to confirm your their arrival. 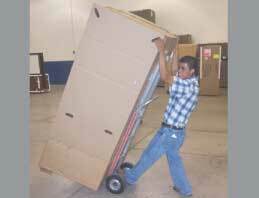 The driver will take the box to the tailgate of the truck and hand the box to you. You will just need to lower and remove the carton. You may choose to pay the liftgate fee to have the divider lowered to the ground from the rear of the truck. Speak to a Screenflex sales consultant regarding delivery details. Once the carton is lowered to the ground the box is ready to be removed. Begin by pulling down all the flaps from the bottom of the box. After all the flaps are pulled down, split the carton on either side. This will make it easier to remove the top of the carton. After you have removed the top of the carton remove the tubular pieces of cardboard from under the casters. When all the casters are free from its base your room divider is ready to be wheeled into the building. Each room divider is about 25″ wide and should easily fit though any doorway. Now you are ready to enjoy your new Screenflex room divider.